Internationally best-selling author Tim Dorsey's irreverent and hilarious novels starring evil genius Serge A. Storms, lovable psychiatric hospital escapee, zoom along at breakneck speed, delivering laughs and shocks in droves. In Torpedo Juice Serge heads for the Florida Keys, where, curiously enough, he isn't the saltiest nut in the jar. Since it's always a good idea to fly under police radar, Serge figures the Keys are just the place to lie low. Plus, he has two missions to accomplish: re-invent himself and get married, although he hasn't picked the lucky lady yet. But what he doesn't know is that enough serial and spree killers are headed his way to have a parade of psychopaths. Are the Keys big enough for all the lunatics? ©2005 Tim Dorsey (P)2005 Recorded Books, LLC. The most hilarious book I have ever read. so that you have to go back to read it again. Serge is hilarious and his sidekick. If you don't have a sense of humor you may miss a lot. George wilson is the very best narrator out there. Bar None especially in torpedo Juice. This is the first audiobook I Purchased written by Tim Dorsey. Now I am hooked!!! 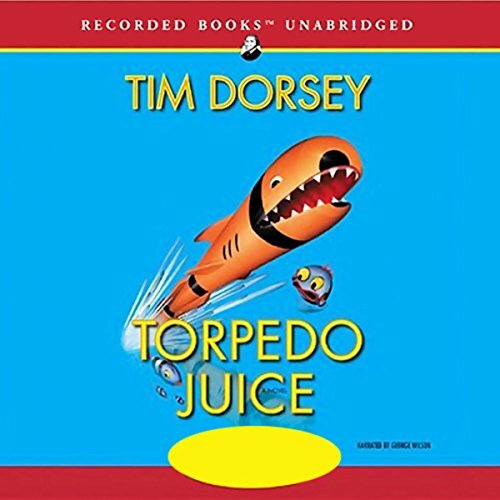 Since listening to Torpedo Juice I have read or listened to all Tim Dorsey's books, but being my first - this audiobook will alway before extra special to me ... SOOOO funny. This is a chance to take a mental vacation into a world of complicated characters. I enjoyed the book. The chapter headings run into the word before them and make it feel like parts are missing, but the story is so bizarre that without the book to compare to it's impossible to tell. I always enjoy Serge's antics. He's insane in a fun way and combines genius with murder. What does George Wilson bring to the story that you wouldn’t experience if you just read the book? George Wilson keeps the characters alive. He does remarkably well with such a complex narrative. If the chapters didn't run into one another and if I didn't have the sinking suspicion I was missing the last paragraph or so of some of the chapters, I would have no complaints. We all have a little (or a lot) of Serge in us or at least we know someone who could trigger us up to that level. This is a very funny book - read it while walking the dog! Loved it, another great book. I re listen to this book on every trip to the Keys. Another great Dorsey book. This time in the Keys. Can not say much - Serge is at it again. Where does Torpedo Juice rank among all the audiobooks you’ve listened to so far? HIS CLEVER THINKING IS VERY ENTERTAINING. Which character – as performed by George Wilson – was your favorite? CHAPTER 33 HAD ME LAUGHING OUT LOUD. TIM DORSEY IS A MASTER AT WRITING ENTERTAINING MATERIAL. If you could take any character from Torpedo Juice out to dinner, who would it be and why? Serge, his mind is amazing! A must read, or, as in this case, listen! !